The "Indigenous Education in the Northern Territory" report says the Territory education system in the bush is second rate and is forcing Aboriginal people into a lifetime of welfare dependence. Professor Helen Hughes says remote schools don't follow mainstream curricula, have inadequate space and lack sufficient teaching materials, and argues 10,000 young Indigenous people in the Territory are unemployable because they can't speak English, are illiterate and non-numerate. Professor Hughes says the Territory Government has known for 10 years that the education system for Aboriginal students isn't working, but has failed to act. The Northern Territory Education Minister Marion Scrymgour says the claims are based on one remote school and can't be substantiated. "Helen Hughes is talking about Yilparra. I just find it astounding that she bases a report and a generalisation across the Northern Territory Aboriginal communities based on one small homeland centre that she has visited." 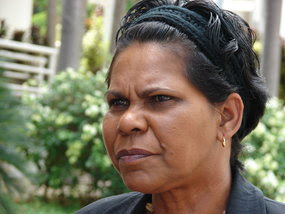 The Northern Territory president of the Australian Education Union Nadine Williams has also attacked the report, saying teachers in Aboriginal communities are being unfairly targeted. "It would be helpful if Helen Hughes had ever been to some of the places she's talking about and if she could possibly cease to stop generalising from a number of individual children and young adults she's met and had experience with to what she says are all homeland schools or all remote schools." The Territory Opposition Leader Terry Mills says the Professor Hughes report concerns him and he wants an independent inquiry to determine the standard of Aboriginal education in the bush. "The Territory Government has no option but to immediately implement an independent assessment as to whether the claims made by Professor Helen Hughes are correct or not. Now there is no other option."